Each year nearly 1,400 children ages 14 and under are kill in motor vehicle accidents, and an estimated 280,000 are injured. The Jasper Police Department has recognized this growing problem, and in response in May of 2009 we became the only Car Seat Fitting Station in Dubois County. 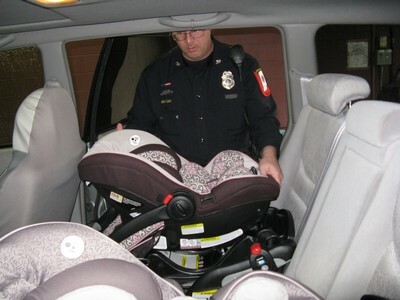 The primary goal of our Car Seat Fitting Station is to ensure that every child leaving the inspection is protected from undue injury in the case of a vehicle crash; furthermore, our trained and certified officers strive to assist parents and caregivers with proper car seat use and installation. Call the station at 482-2255 and ask for Officer Mike Stallman, Officer Jason Knies, Officer Brian Lampert or Officer Greg Brescher to set up an appointment to have your child's car seat inspected. The Jasper City Police Department's Car Seat Fitting Station offers these tips for ensuring that your child is secured safely when traveling. Children ages 12 and under should always ride in the backseat, especially if your vehicle has a passenger-side airbag. The middle of the backseat is the safest. Read your child restraint owner's manual for instructions on properly using the restraint. This manual provides you with crucial information about the car seat that shouldn't be overlooked. Follow the weight limits recommended by the manufacturer of your car safety seat. Putting a child in a seat that is too big or too little for the child can have devastating results. Check to see if your child's restraint has been recalled. A car safety seat may be recalled because of a defect that could injure your child. Manufacturers are required to fix the problem free of charge. If you are unsure of whether your seat has been recalled, call the Department of Transportation Auto Safety Hotline toll-free at 888-327-4236. If your seat is recalled, use the seat until you get a new one. It is almost always safer than letting your child ride with a safety belt only.